Cavaliers have long, floppy ears that minimize air circulation and tend to trap moisture and dirt in their ear canal. Cleaning your dog’s ears should be part of your regular pet care routine. If neglected, dog’s ears can become itchy and bothersome to your pet, and ultimately painful and infected. How To Clean Your Dog’s Ears from Life’s Abundance on Vimeo. Caring for your dog’s ears is easy. 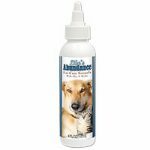 Buy a alcohol-free, non-irritating ear wash made specifically for dogs. Pull back your dog’s ear, moving the hair out of the way. Insert the tip of the bottle of ear wash into his ear canal. Squirt enough solution to partially fill the ear canal. Massage the base of your pet’s ear for a few seconds to help dislodge ear wax and debris. Then, use a cotton ball or pad to wipe away the excess liquid and dirt. Repeat until the cotton ball comes aA Sway clean. Alternatively, wet the cotton ball with ear cleaning solution and insert into your dog’s ear. Gently move the cotton ball around to massage the ear canal and wipe away dirt and ear wax. Never use a q-tip or force anything too deep in your pet’s ears! Notice how your dog’s ears smell different when they are clean than when they are filled with dust, dirt and wax build up? Don’t wait for your Cavalier King Charles to start shaking his head or scratching his ears to tell you there’s a problem. Check your Cavalier’s ears regularly with a small flashlight, and take a good whiff!